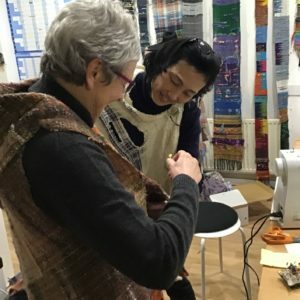 4 Workshops with Mihoko to start 2019 in style! It was a tremendous treat for me to host Mihoko from SAORI Worcester, Massachusetts, at SAORImôr. I met her at the beginning of my SAORI journey when I went on one of her SAORI/Japanese culture tours. She has become my SAORI sensei (teacher) and close friend. We had very little time to organise events but I hope she will be able to visit again sometime. Keep an eye on my facebook page for regular updates of all my activities. In this lecture Mihoko told us about herself and how she found SAORI and set up her studio in America. 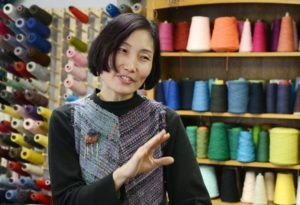 She talked about Misao Jo, the founder of SAORI, her philosophy and the aims of SAORI free-style weaving throughout the world. It was so interesting to hear the SAORI story from a Japanese viewpoint. She then gave a demonstration of weaving on a SAORI loom. We were able to benefit from the excellent technical assistants in Pontio, the University’s Arts and Innovation Centre. 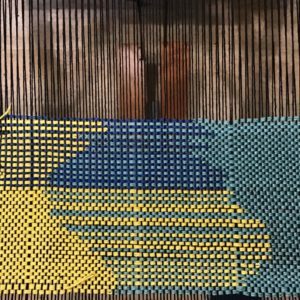 We had a camera focused on the loom that was then displayed on the big screen. 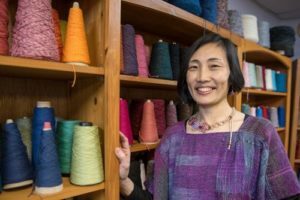 You could see clearly what Mihoko was weaving and follow what she was demonstrating. It was greatly appreciated by the whole audience so I will definitely be doing that again! 1. 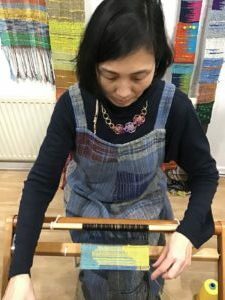 Mihoko’s introduction to SAORI weaving. We had a very full studio! Everyone introduced themselves, told their stories, and shared their interests and hopes for the day. The atmosphere was buzzing and the looms were soon humming. We covered a multitude of SAORI topics and everyone was happy. Sharing makes all the difference! With just a small group we were able to go through the process twice. This allowed each person to have a hands-on guided experience of using the warping equipment designed by Kenzo to make warping straight forward and simple. 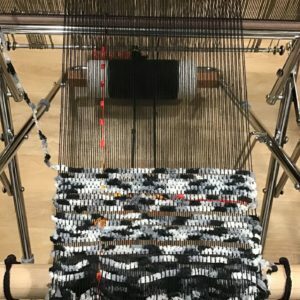 I know many people feel daunted by the idea of making their own warps but this system encourages you to start. Also the ‘Threading and Beaming Holder’ sits on the table which makes the whole process more comfortable and accessible. 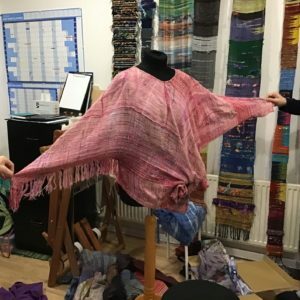 Click here to see when I am running a Kenzo Way’ warping class at SAORImôr. Mihoko introduced some techniques and then encouraged everyone to explore these in their own way. After learning a technique it is a challenge but great fun to play with it to see where it will lead. This is also an exciting way to work in a group as we all learn from each other and can share experiences. 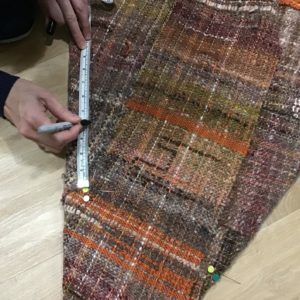 Click here to see when I am running a SAORI techniques class at SAORImôr. 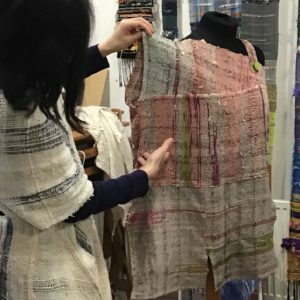 This is often the biggest hurdle of all, to commit yourself to cutting your beautiful and special woven SAORI cloth and to make up a garment. 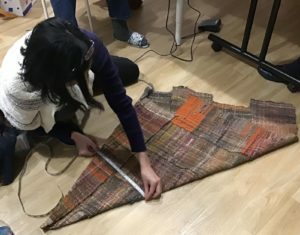 Mihoko gave guidance on how to approach this using paper and tape to make mock ups to give an idea of where the cloth is to be cut. Next we were shown a selection of garments she had brought with her to show just how simple the patterns are and yet how effective in showing off the cloth. Beautiful garments everyone can achieve. She then demonstrated by making a ‘squid’ top (from one of the SAORI clothing pattern books) with a piece of her own weaving. She managed to do this in about an hour, whilst we were all asking questions and talking! Be brave and give it a try. You won’t be disappointed and making your own garment from your own cloth is truly satisfying and rewarding. 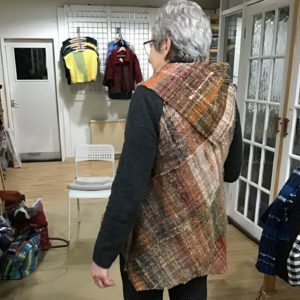 Click here to find out when I am running a clothing class. The final event with Mihoko was Take pART, an annual 2 day arts and science event held in Venue Cymru, Llandudno. It is aimed at children of all ages and their families. This is an awesome event with so much going on. 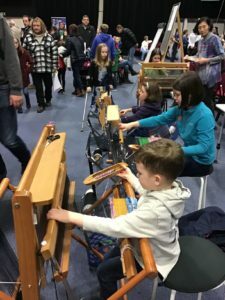 There are workshops of anything creative such as circus skills, aerial dance, clog dancing, model making with Aardman, film and video workshops or opera singing and harp playing. We take 4 looms and give as many children as possible a chance to have a go. At the end of the event we have 8 huge banners woven by approximately 300 kids! Amazing, exciting and inspiring! 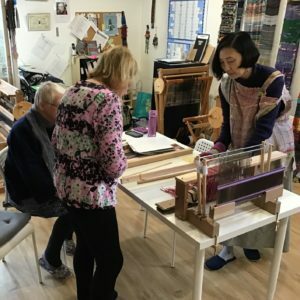 Loom Delivery and workshop with the Tawe Guild of Spinners Weavers and Dyers. 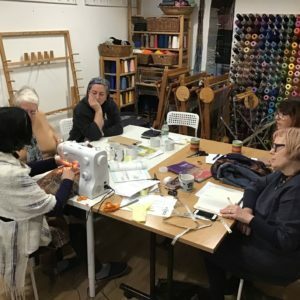 The Tawe guild have a permanent venue where they meet every week, run workshops and events and, most importantly, can store all their equipment, materials and books. They worked hard together to secure themselves a grant to buy a SAORI loom with some accessories and yarn. 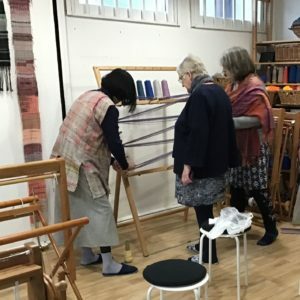 I was very pleased to deliver the loom and run a one day workshop. This enabled them to familiarise themselves with the SAORI free-style weaving philosophy and get to know their new loom. It was a fun, full on and satisfying day. By buying extra ‘inside sets’ the SAORI loom is perfect for sharing. 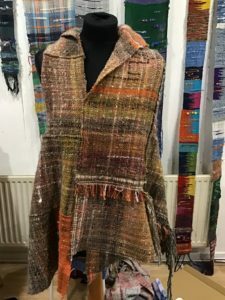 There is no need for one person to finish a piece of weaving before someone else can have a go. 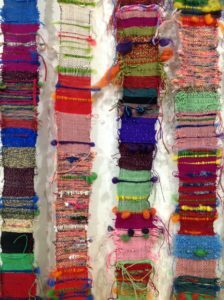 Therefore each person can keep their own project on the go while passing around the loom to other members. Hence the loom is always in use which solves the problem of storage that most guilds have. An excellent investment! Please ask here if you would like more details.